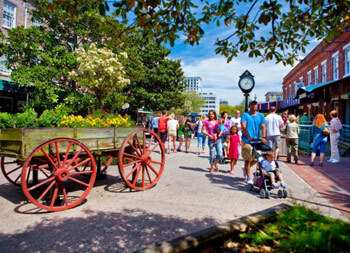 Since the early 1700’s, City Market has been the commercial and social center of historic Savannah. Located on the original site of the market used by farmers and traders of all kinds to sell their goods and wares, City Market offers the best of what is old and what is new in Savannah. Indulge in brands you love at the best shopping mall in Savannah. Visit Oglethorpe Mall in Savannah for shopping, dining, and entertaining. At Savannah Festival Outlet Center you can expect the lowest prices everyday. Over 115 stores, 3 department stores, food court, 2 restaurants, 21 theaters and a carousel, located in Savannah, Georgia.